Maybe you’ve seen it on food shows. Maybe you saw one at a traditional Asian restaurant? Those large, bowl-shaped cooking pans used by professional chefs, where they toss and mix food ingredients under overwhelming, high flames. Then the chef pours some kind of a wine and the flame just rages, leaving you very amazed with mouth wide open. That, my dear friend, is a wok— a traditional cookware in the Asian culture! Why Should I Get a Carbon Steel Wok Over Woks Made of Other Materials? The flared, tall edges of a wok serve the purpose of keeping the ingredients from falling or jumping out of the side of the pan when attempting to toss the contents and ensures that you do not find half of your dinner on the floor. Moreover, these tall edges provide more cooking space for searing ingredients. If you are browning meats, you can arrange it on a single layer to the edges of the wok which gives you more surface area than in a standard sauté pan. By tradition, woks were always rounded since they were meant to sit in coals of fire. Nowadays, the newer models are usually forged with a flat bottom in order to accommodate Westernized cooking surface. Flat bottoms ensure that the pan will not topple over even if you leave it unattended. There are just some kitchen items that do not need any introduction at all since everybody knows just how useful and versatile they are. The humble wok, particularly the carbon steel type, is a very interesting kitchen tool that will surely expand your horizons in terms of everyday cooking. 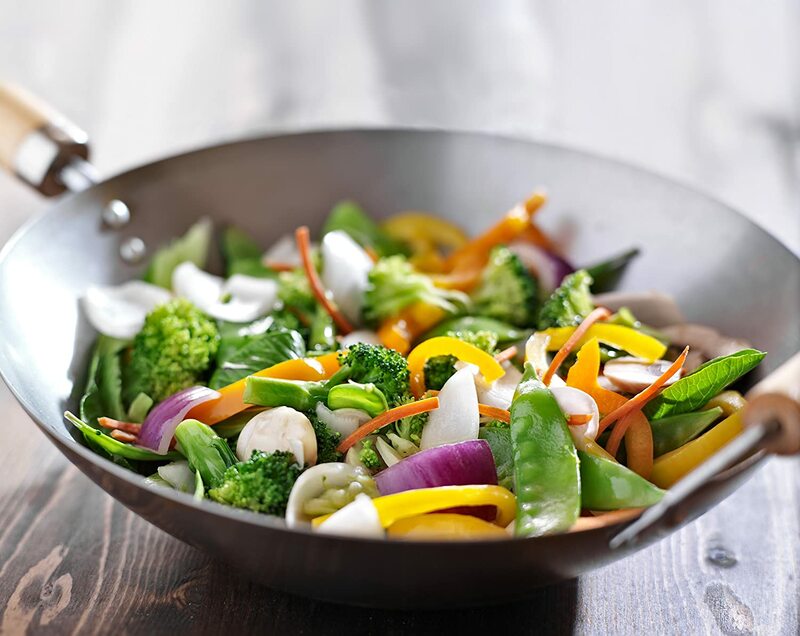 Stir-frying: Frying food in a small amount of oil on high heat and continuously stirring. Braising: It is the most common use of a wok. Pan Frying: Frying in a small amount of oil. Deep Frying: Frying food in a lot of oil, typically in deeper woks. Boiling: You can use it for cooking rice and soups. Ceramic cast iron, anodized aluminum, electric, stainless steel and other non-stick surfaces are materials available for woks. With a lot of options and materials to choose from for your new wok, you are probably wondering why I suggest that get a carbon steel wok over other options. Almost all cooking methods and techniques need high temperatures. Some metals such as aluminum, release toxins when heated, thus posing a health threat to you and your family. Carbon steel, on the other hand, does not release any toxins even when it is heated on very high temperatures, thus it is safer to use in cooking. Carbon steel woks provide an even and rapid heat distribution, unlike stainless steel pans. It is the ability to transfer heat faster that can help you prepare food faster, resulting in more save energy. Carbon steel woks are much cheaper than their cast iron and stainless counterparts. This gives you the opportunity to prepare tasty and healthy meals without breaking the bank. When compared to cast iron, carbon steel are quite similar— they are both made from carbon and iron, although in different proportions. Cast iron has 2-3% carbon while carbon steel has only 1% carbon. This may look insignificant, however, it is world’s different. Both materials similarly behave when heated, however, carbon steel is more pliable and lighter than cast iron which becomes heavier and more brittle. This gives you the freedom to toss and flip your food and transfer the wok without so much strain. Carbon steel woks heat very fast and provide even heating. Not only that, it also allows even cooling. This should give you better control when cooking your favorite food that requires medium to low temperatures by regulating the temperatures when it goes pretty high. Carbon steel woks are crack and chip resistant since it is made of a durable metal making it stand out from other wok materials. However, without proper care, carbon steel wok might rust and affect its durability. Seasoning it can help provide a good mileage and allows healthy cooking. Carbon steel woks are very specific— you need to follow some rules if you wish to use it for generations to come. You need to know that every wok needs to be thoroughly cleaned before you use it for the first time. This is to remove the factory protective coating prior to cooking. Just wash it with warm water and soap and scrub it thoroughly with a scrubbing pad. Rinse and wipe dry. Also, most carbon steel woks are not dishwasher safe. Meaning, you need to make the effort to wash and scrub it with warm water and sponge every after use. Initial Seasoning is an important step that you should never skip whenever you use your carbon steel wok to ensure that it will last for generations to come. Seasoning acts as a non-stick seasoning and should prevent sticking of food to the wok surface. To do this, you need to rub cooking oil onto the interior of the wok before you go on with your cooking. A wok is a great addition to your cooking utensils and will provide great service for your cooking needs. However, when it comes to shopping for one, people most often struggle with finding the right one. Here are some features you need to look out for to help you buy only the best carbon steel wok on the market. Carbon steel wok comes in 2 different bottom shapes. You can use either a flat-bottomed or rounded bottom wok for gas stovetops. However, if you have an induction or electric range, it is best to go for a flat-bottom style since it will comfortably sit on top without wobbling. The diameter and height of the wok should also be considered. And make sure to check its concave properties. If you buy a wok that is too deep, then the heat will only be retained at the bottom and heat transfer to the side will not be enough, thus an uneven cooking. If it is too shallow, then you might not be able to toss and mix the foods up to the sides. The easiest way to tell a good quality wok is by looking at its materials and how it was made. 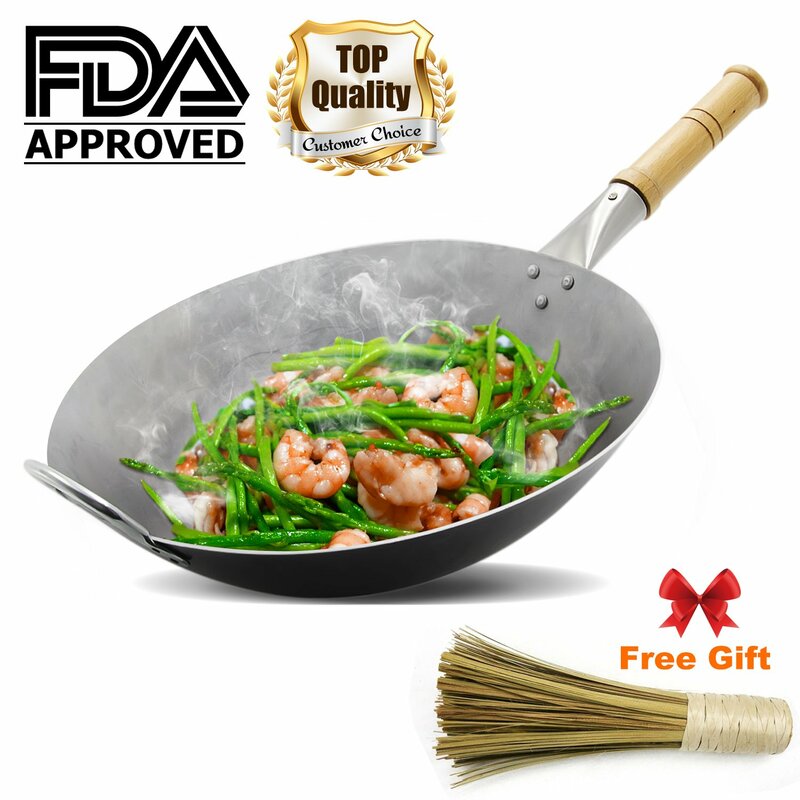 There are various styles of carbon steel woks such as hand-forged woks which are of better quality and stamped wok which is cheaper, yet not as durable. Woks come in various handles: some come with 2 small loop handles that are opposite to each other; some have a loo handle on one side and a long handle on the other side; while others simply have this one long handle. Know that all handles serve the very same purpose: to lift up the wok. Choose your wok based on your cooking techniques and preference. Woks are made with different methods: stamping, spinning and hammering. The stamping method involves the bending of a piece of metal. Woks made from this method have smooth sides. However, it is important to know that woks with smooth sides are clumsy at holding food, thus these are not the best out there. The spinning method produces woks with granular sides. Woks made with this method have concentric circles down the pan which allows you to place food on the side without it sliding. This gives full control on cooking different kinds of food. Hammered woks are those with small divots or indentations produced by each hammer blow. This is not noticeable if you don’t look closer enough. The edges of a hammered wok are rough and serve really well in holding your food in place. Both hammered and spun woks are cheaper and affordable and would be a great choice for your cooking needs. There are woks individually sold. There are some that come in a set which consists of a spatula, burner, rings steamer tray, ladle, lid and more. Determine what you will use your wok for before purchasing. Other than stir-frying, there are other cooking techniques like deep frying, smoking, and steaming and all these will need extra pieces of utensils for a successful cooking. If you prefer a traditional hand hammered wok, then this wok design from Craft Wok is the best option for you. Even though it is a little costlier than budget woks, you will be reassured because of its exceptional quality. And I should say that this carbon steel wok is authentically made in Guangzhou, China, making it a wok that closely resembles the original designs and styles of Asian cooking woks. This carbon steel wok features a wooden steel handle which makes cooking easy— tossing and flipping your stir-fries without the risk of burning your hand. Plus, it can withstand higher temperatures, for a worry-free cooking. The Craft Wok has a thickness of around 1.8 mm and made from 15 gauge carbon steel for faster heating and keep the entire wok at an optimal temperature. Everything about this carbon steel wok has been carefully designed in order to make cooking at home easier and more enjoyable. Made out of 1.6 mm carbon steel, this kitchen wok was designed by Helen Chen, a known name in Asian cooking. With a size of 14”, it is the carbon steel wok in creating a delicious Asian dinner for the whole family. It features a flat bottom design which is suitable for any gas, induction or electric stove. The concentric grooves of the carbon steel are visible and provide a constant and rapid heating as well as cooling of the wok. It features 2 attractive and heat resistant wooden handles— one helper handle and one main “stick”. Plus, it has a loop on its handle for an easy hanging storage. This carbon steel wok from Helen Chen also features a doomed metal lid which allows steaming and can even accommodate bamboo steam baskets. This carbon steel wok is also perfect if you think about giving it as a present for an aspiring Asian food chef. This is because it comes very nicely packed and quite generous with accessories— a recipe book, spatula and a lid. Joyce Chen first opened her restaurant back in the year 1958. Her high standards in Asian cookware make her decide to produce her own. Now, Joyce Chen produces best quality cookware from all over the Pacific Rim. 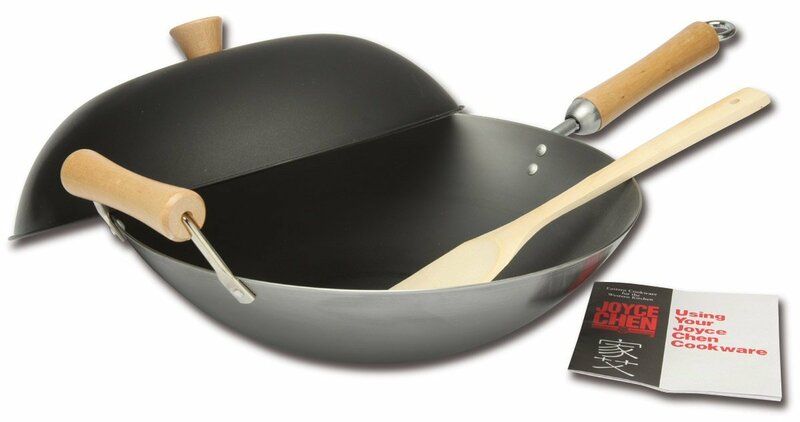 A standard family size wok, this carbon steel wok is one of her best sellers. It is 14” in diameter making it really light and easy to lift. This wok is 2mm thick which allows a rapid and even heating. It also features a flat bottom design which can be used in induction, electric, and gas stovetops. With an ergonomic phenolic handle which fits really well in your hands and stays cool despite high heat when cooking, you can toss and flip your food with full control. Its additional handle helper provides stability to the pan and easy transporting from the stove to the countertop. Moreover, this carbon steel wok offers easy storage, thanks to the loop on its handle. Well, because of the popularity of Joyce Chen products, it is no wonder that another product of hers make it to this list. From her Classic Series, comes this 14” carbon steel wok that is the perfect combination of size, function, and features. It has a 1.5 mm gauge carbon steel body that makes it very durable and wear-resistant. It heats slower than other thinner woks, however, it heats very evenly, so it works really well with anything that you will be cooking. It has Birchwood handles go a long way in keeping your hands safe from fire and cool while cooking. A side helper handle is also added for easy lifting and transporting of the wok. Moreover, its curved sides design extends the cooking surface, which helps with stirring and tossing. Here comes another top quality carbon steel wok pan with an FDA approval for safety. 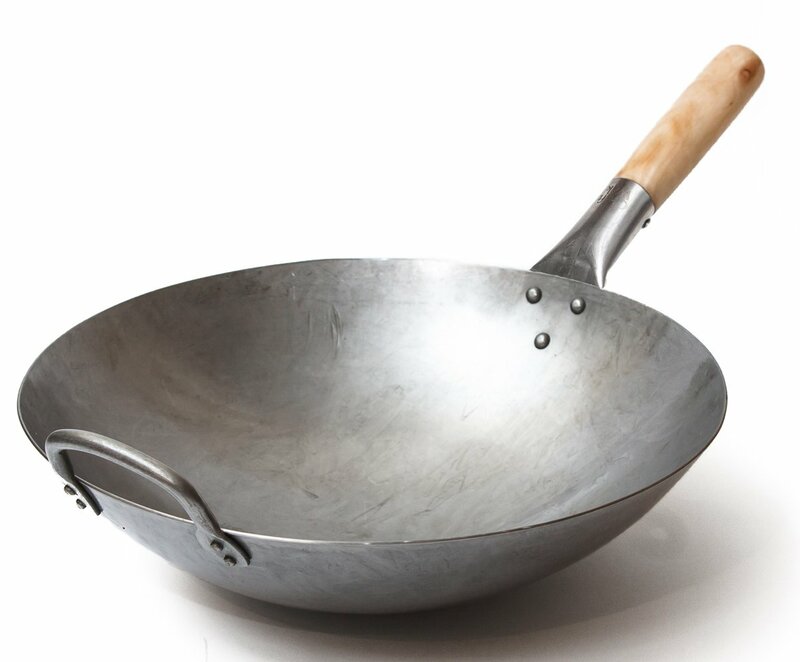 The IEOKE uncoated carbon steel wok is a Chinese hand hammered wok that is made from high-quality wrought iron. When compared with other woks, this carbon steel wok is firm and has a uniform density without any air bubbles or hollow from the surface. Adopting a premium quality iron with few impurities and a smooth surface without coating, this carbon steel wok gives a physical non-stick surface for a problem-free and healthy cooking experience. Its thin wall and thick bottom structure provide evenly heating. Moreover, it provides great thermal conductivity for transferring heat to the food directly in order to ensure cooked food in no time and save electricity or gas. It features a heat-resistant wood handle for safe cooking and a convenient handle for easy transferring and lifting. Helen’s Asian Kitchen Flat Bottom Wok! It features unique, beautiful wooden handles and a high lid which can be used for steaming. Furthermore, it has the capacity to cook meal enough for the entire family as well as guest and friends who decide to stop by. Moreover, among the 5 woks, I have listed here, only this carbon steel wok is generous enough to give away other accessories which prove helpful in taking your cooking skills to the next level. The wok is a kitchen item that has been used for centuries and will undoubtedly be used well into the future. So, you need to take time in making a serious decision when investing in this one piece of cookware and make sure to get the best one to serve you for the many years to come. I hope you find this buying guide helpful. If you have something on your mind, feel free to voice it out through the comment section below. NextNext post:How Much Juice is in One Lemon?